Bodega Bay is a natural harbor resulting from movement along the San Andreas Fault. The eastern shore is straight and parallel to the edge of a wide zone of faulting that extends across the bay to the hills on Bodega Head. During the 1906 earthquake, 15' of movement displaced the harbor to the north relative to the mainland along a distinct line (photo 1). Downward movement of the fault zone and erosion of rocks shattered by faulting gave us the depression of the bay. 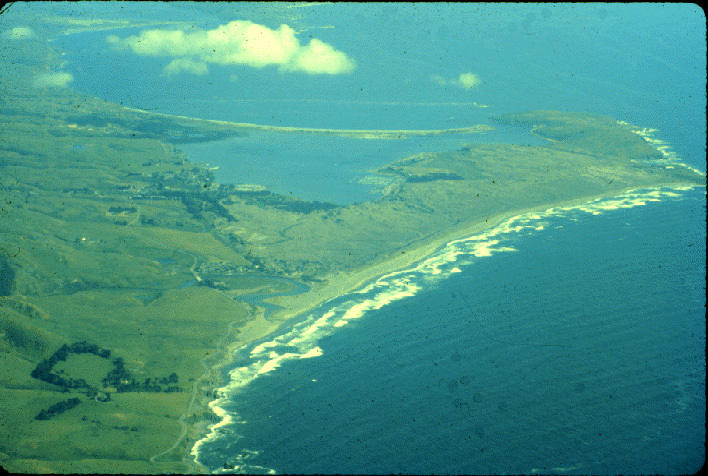 A sand spit closes the bay to the south at Doran Beach and a wide reach of sand dunes forms a northern barrier along Salmon Creek Beach. The rock contrast across the fault is profound. 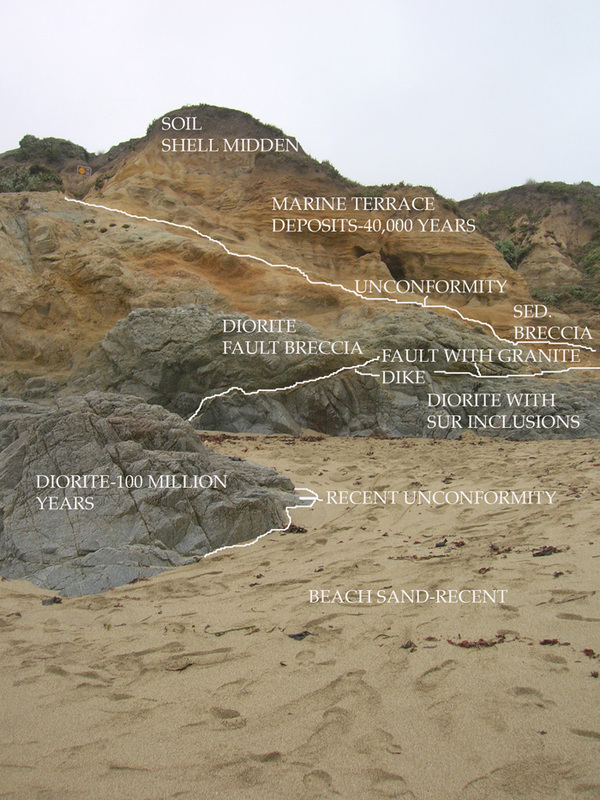 We see oceanic rocks of the Franciscan Complex (See shell beach link) to the east and continental granites exposed on Bodega Head, a fragment of southern California or Baja California dragged north along the fault. If we try to match rocks from Bodega Head to rocks east of the fault, we have to go at least to the Tehachapi Mountains, 300 miles to the south to find similar granites. Some people feel the match is best in Baja California, several thousand Km to the south. Besides the many attractions of good food and tourism [link to bodega bay page: http://www.bodegabay.com/], natural attractions abound. The Bodega Marine Lab, run by the University of California has tours friday afternoons and many ongoing research programs on marine biology. 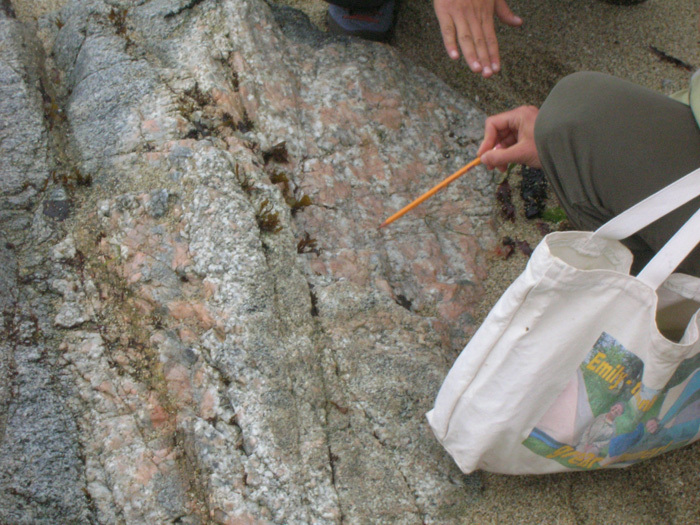 The beaches and landscape surrounding the bay are a natural lab for geology and biology. Our field trip here takes us to the tip of Bodega Head to see perfect exposures of the area’s underpinnings and reveals the events that shaped the history of these rocks. Access to Bodega Head is via the road which turns west off of route 1 north of town at the "Bodega Head" sign to Bay Shore Road which leads west around the bay. A sharp right turn up the hill by the jetty leads to another junction where a right leads to the parking lot at Windmill Cove. The windmill is long gone, but this is still a great spot to watch the whales on their migration in winter and early spring and to see revealing exposures of the rocks of this side of the SAF. Looking down from the parking lot to the north, you can see a small beach with rocky outcrops on the north side view. Hike down the path that leads down the first main gulley north of the parking lot. This is a bit muddy in winter and spring, and slippery, so good footware is advisable. As you descend the trail, you can see a set of layered rocks, marine terrace deposits on the right and left (see description below). Study the gray rocks just above water level on the north side of the beach. These are diorite, a cousin of granite. The rock sequence exposed here includes the major players in the historical drama that constructed the land we call Salinia. The stretch of coast including the Santa Cruz Mountains, Big Sur and Point Reyes are part of the same terrane. The players include a sequence of older metamorphic rocks, intruded by 80-100 m.y. plutonic igneous rocks and a mantle of much younger sedimentary rocks. 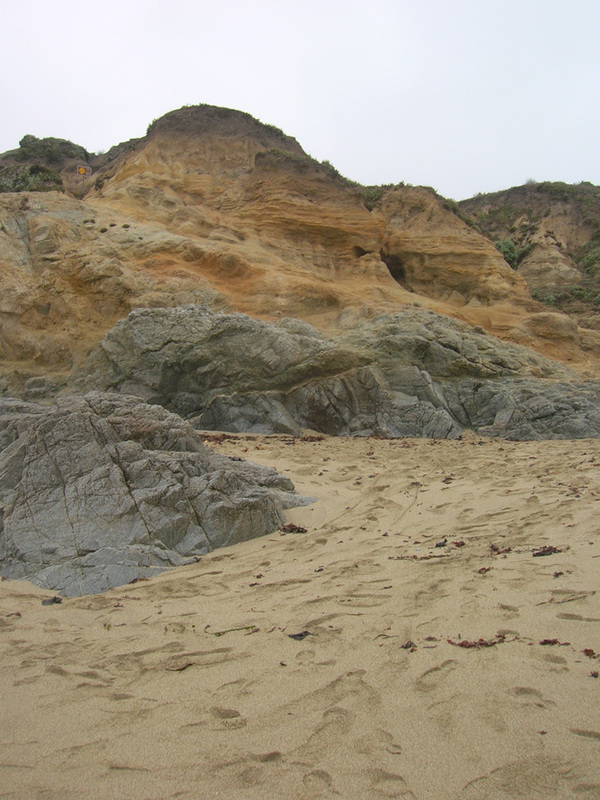 The gray rock here is named the Bodega Head Quartz diorite and is dated at 100 million years old. The plutonic igneous rocks have salt and pepper texture with visible crystals. They are darker than the average granite, so are classified as a diorite. Close examination with a hand lens will reveal gray glassy quartz, white feldspar and black amphibole. probably ripped off the sides as the molten rock intruded a chamber deep within the earth. These are known as the Sur Series after similar rocks exposed in the Big Sur Mountains. We do not know the age of these rocks, but recent age dates on grains of zircon indicate they are very ancient, part of the original continent more than 1 billion years old. These grains could have been eroded from older rocks, but we do not know their complete history because it has been masked by metamorphism. Limestone changed to marble, shale to schist or gneiss, with no trace of the original rock. Here they are visible only as ghostly dark patches in the quartz diorite. Pocked patches of light colored marble react to hydrochloric acid. Striped fragments of gneiss are found in the overlying marine terrace layers. On Point Reyes, we find the same rock sequence with large blocks of gneiss and marble preserved on Mclure beach. Standing in the small sandy slot near the water on the north side of the beach, you can see a smooth wall of quartz diorite. Light colored minerals are glassy grey crystals of quartz and white, opaque crystals of plagioclase feldspar. Dark flecks of biotite and hornblende cause the pepper effect. On the low ledge to your right, you can see a dark patch, remains of the Sur Series. The fragments were so small that they were completely changed to a dark granular rock by metamorphism from the heat of the diorite. Looking up at chest level, we can see a pink stripe cutting across the ledge. These pink stripes also paint other cliffs. 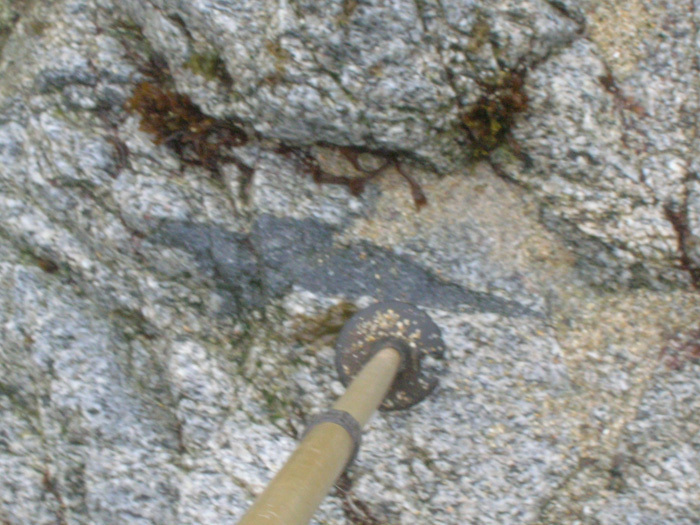 This is a granite pegmatite, a coarse-grained granite. It cuts across the diorite, and so is the younger rock. Gray quartz and large pink crystals of Potassium Feldspar dominate. We see this sequence repeated in igneous rocks all over the earth, and so we realize that a theory can be based on this simple observation. The theory is called "Bowen's Reaction Series" and it states the sequence of crystallization of minerals from molten magma. Common sense tells us that the simplest things are the easiest to form, in terms of minerals the easiest to form have the simplest atomic structure. Crystallization then must progress from the simple to the complex. In rocks we see the simple structures of the iron-rich minerals forming first, and the highly complex silicon and oxygen rich minerals forming last. From a magma forming diorite, with some dark minerals and quartz, the next step would be granite, with an abundance of quartz and potassium feldspar. The pink color of these stripes is from large potassium feldspar crystals. On top of the pink stripe we can see more quartz diorite but it is in fragments, as if it were broken and shattered. Also, just above the pink granite there is a thin layer of clay, with fragments of quartz and pink feldspar in it. Why is there this sudden difference in the quartz diorite and what clues to this mystery can we see in the clay layer? The broken up rock tells us that high pressures have been active and the clay layer looks like ground up flour from the quartz diorite The evidence of grinding and pressure tells us that this is a fault, more personally called the Windmill cove fault. Movement along this plane has fractured the rocks above and milled the rock to a clay- rich vein we call fault gouge. The fault runs along the shore to the north and can be followed easily across the bare rock terraces. It looks like a thrust fault, and may be related to stresses along the SAF. Scrambling uphill from here, we come to a point where sandy layered rocks overlie the broken quartz diorite. This is a profound contrast in rock type and indicates an important turn of events in the geological history. The granite and diorite are very old and formed deep under the earth's surface. The sand layers look like the ones forming today on the beach and underwater offshore, so they must be very young and formed at the surface. There is a lot of geologic time missing here, around 100 million years of the rock record are missing, eroded away or never deposited. Also there is a radical difference in environment of rock formation. This is a geologic unconformity, where part of the rock sequence is missing. What could cause such a contrast? 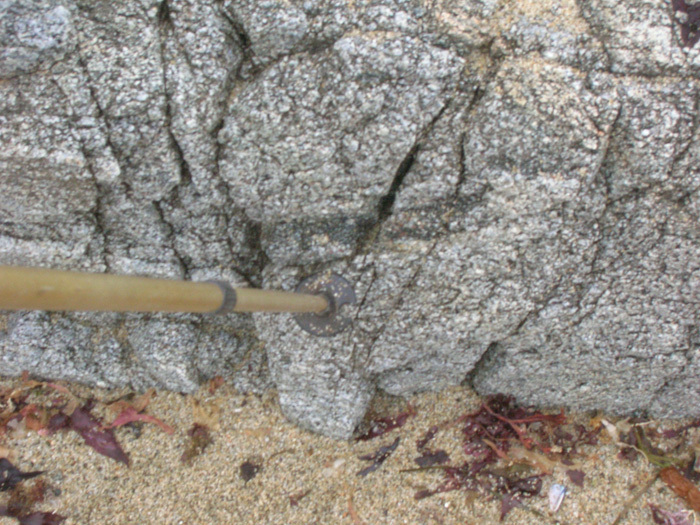 The only way we can expose granite at the surface is by erosion, and in this case deep erosion can only be caused by uplift of the surface of the land. These granites formed deep in the bowels of a mountain range, which eventually was worn down to sea level over millions of years. The waves ground up granite and made it into sand, which formed the layers we see. Wave erosion penetrates to a level about 15 feet below the ocean surface, forming a relatively flat surface called a marine terrace. We can see flat terraces carved on diorite, quartz diorite to the north which have been uplifted just above sea level. The arkosic (feldspar-rich) sandstones above have horizontal layers, formed on a flat surface that has been pushed up to present elevation Uplift here has been steady for the last 3 million years. The following photo shows the rock units and structures labeled on a view from the beach. The Coast Ranges are caught between the Pacific and North American plates with horizontal movement along the SAF and convergent motion as well. This forces the marine terraces upward at rates of between 0.5-1.0 mm per year. We find 40,000 year age dates for these rocks using Radioactive Carbon from dark fragments of carbonized wood occasionally visible embedded in the sandstones. We can see large chunks of quartz, diorite and pink feldspar in the sandstone just above the diorite. 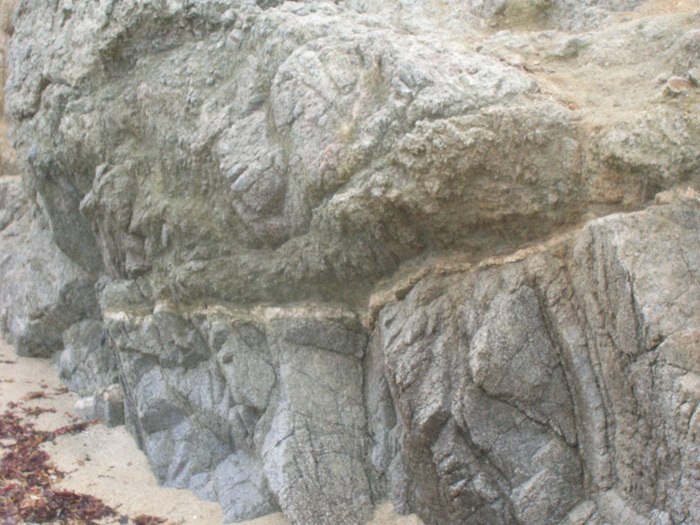 These show that pieces of rock may have fallen from nearby cliffs and settled into the sand. If you look carefully, you might be able to find fragments of shiny schist or striped gneiss, recycled remnants of the Sur Series. 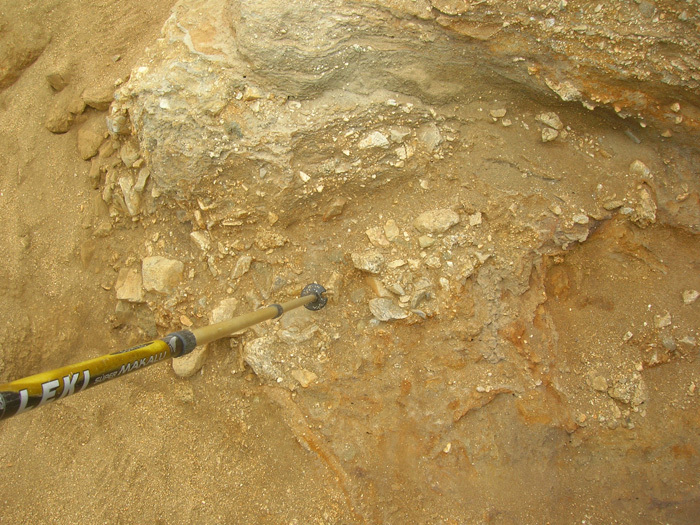 Farther up the cliff, the sand becomes finer grained, but still contains fragments of quartz and pink feldspar, evidence that they come from erosion of the underlying diorite. Also schist and gneiss fragments are evidence that Sur series rocks are also in the local source. The same process that formed these rocks goes on today, forming a terrace under the waves offshore and accumulating sand in layers on the beach. The waves bottom out below the ocean surface to erode the rocks to a flat surface, with occasional resistant blocks of diorite forming islands which we see above water level as sea stacks. Light-colored sand made of quartz and feldspar and larger chunks eroded from cliffs accumulate in layers on this surface. Slow uplift will expose these layers as yet another marine terrace in the geologic future. This is a perfect example of "uniformitarianism", one of the foundation theories of geology. The concept can be summarized by "the present is the key to the past". We can observe processes going on today that are the same as processes active in the past, and the result is similar rocks. Here we can see the older marine terraces exposed by uplift and erosion and we can see the same process forming future marine terraces today. . We can also see the future unconformity between the sand forming today on the beach and the diorite bedrock everywhere they come into contact. An epic environmental drama unfolded here in the early 1960s where PG and E started construction on a nuclear power plant on Bodega Head. Nuclear Power plants need cooling water, and the most abundant supply of cold water is along the coast. Unfortunately, there are many active faults along the coast, and this site was right next to the San Andreas Fault. They excavated a huge pit for the foundation, and encountered the sandstones. A geologist happened to be studying these layers and found that they were offset by a fault. This indicated that there had been an earthquake with offset along this fault less than 40,000 years ago. The fault also may be connected to the San Andreas Fault. We can see minor faults and folds caused by earthquake shaking in the sandstone bluffs along Windmill Beach. Public pressure of the danger of nuclear power plants and the presence of this fault prompted PG & E to decide that it would not be a good idea to build a nuclear power plant on a fault and so they abandoned the project here. 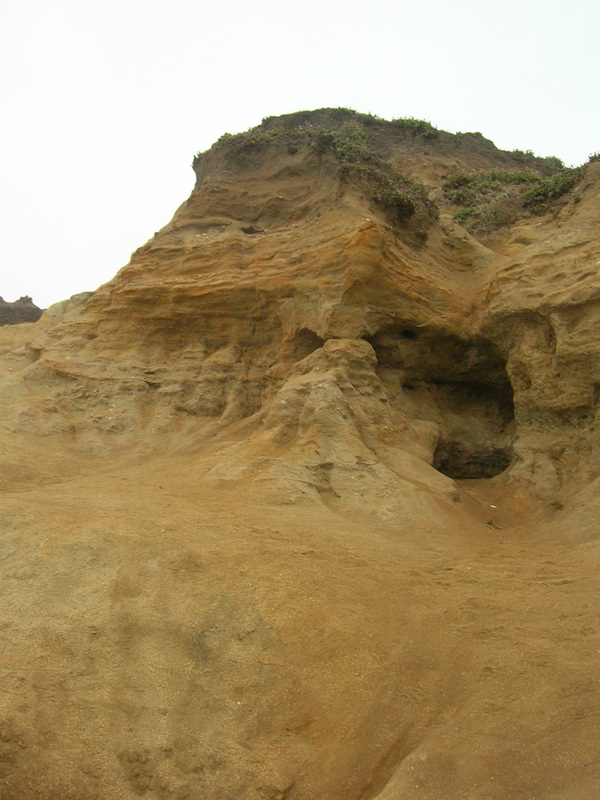 They looked at a site to the north at Point Arena, also next to the San Andreas Fault, but found that the marine terraces there had been tilted recently by large earthquakes. They finally decided on a site to the south at Diablo Canyon. Their studies of that site indicated that there were no active faults in the vicinity. However, during construction, geologists found a new fault 5 miles off shore, and the design had to be altered for more earthquake protection. Unfortunately, workers installed new bracing for pipes from blueprints printed backwards, so more delays occurred before plant completion, all because of earthquakes and geology. At the very top of the sandstone, we can see a dark layer of organic soil with white flecks in it. The white turns out to be shells of local clams, mussels, etc. These are part of a midden, a shell dump from generations of Native Americans who called Bodega Head their home. Until the 1930s there was an active Miwok community located to the south in a sheltered ravine. At Point Reyes, visible to the south on a clear day, we see a similar set of rocks and history. There is a thick sequence of layered rocks between the diorite and the marine terraces preserved there also. 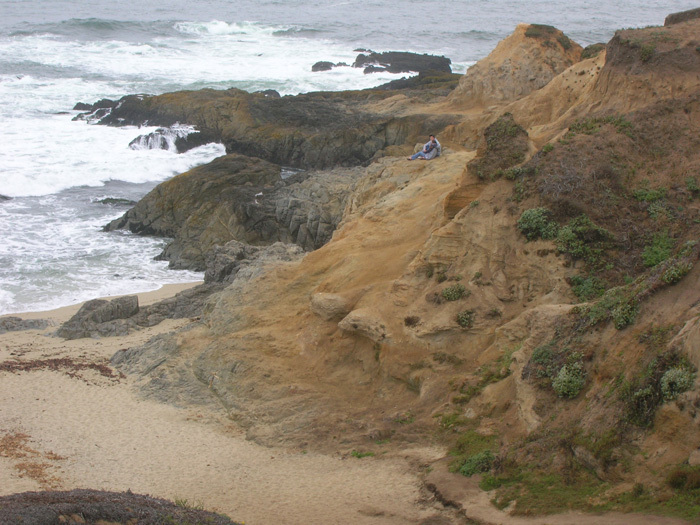 The best Sur Series outcrops around are on McClure beach about .5 km south of the trail end.